My husband has always had problems with his ears, from excess wax causing problems to having water seeping in and causing havoc so Ear Plugs are something he really needs to use when he is in the water. I love that they have more than one color to choose from so if you have more then one family member with ear problems they can each have their own color. Even if you don't have problems with your ears you might find that depending on the job you have you will need to have ear plugs in order to protect your hearing from loud sounds. Some people will even use earplugs while they are sleeping to drown out sounds. As a mother this is not an option because you want to be able to always hear your children in case of emergency. Easy to use, love that they are reuseable. You can watch my husband giving a demo on how to use them. 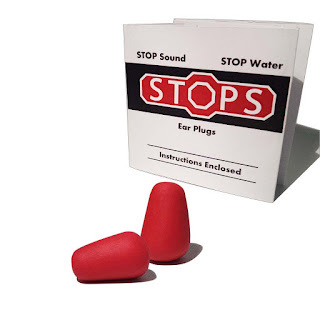 You can purchase Stops Ear Plugs here or on Amazon. What Stops Ear Plugs has to say about their product. STOPS Ear Plugs are well known as the absolute best in both blocking sound and sealing out water. Made from all natural elastic resin, they are extremely durable, re-usable, and unbelievably comfortable. Soft and moldable, they provide a perfect custom fit for every ear canal. Just insert for all day or night relief from loud sounds and water. Disclosure: MarksvilleandMe received one or more of the products mentioned above as part of a promotion with Tomoson and Stops Ear Plugs. Regardless, MarksvilleandMe only recommends products or services we use personally and believe will be good for our readers. Some of the links in the article may be “affiliate links.” This means if you click on the link and purchase the item, I will receive compensation. If you would like MarksvilleandMe to review a product or service please contact us at marksvilleandme@gmail.com.